Two years ago, we conducted our first influencer marketing survey. We thought it was time to update our statistics and discover how perceptions about the industry have changed between 2017 and 2019. We partnered with Viral Nation and NeoReach to survey 800 marketing agencies, brands and other relevant professionals to determine their views and build insight into their thoughts on the industry in 2019. A key finding of our Influencer Marketing Report 2019 is that the outlook for influencer marketing is still extremely positive. Despite naysayers claiming that influencer marketing is dying, our respondents made their positives views for the practice strong. 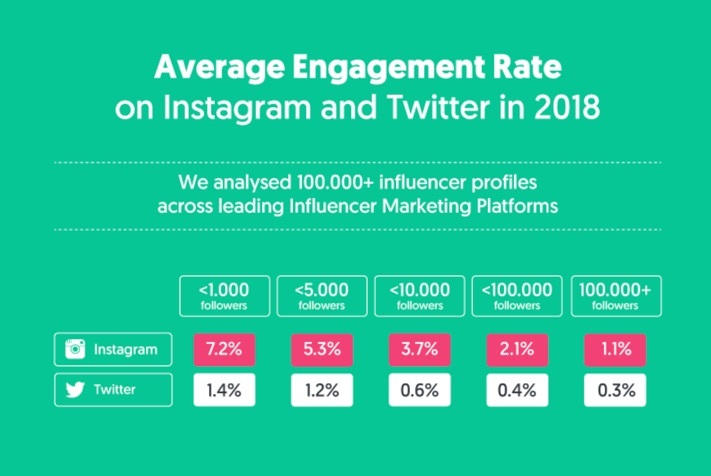 Here are the key results from our Influencer Marketing 2019 Study, along with a few other relevant recent statistics we found courtesy of NeoReach, Instagram, and Google Trends. Instagram is the fastest growing social network in 2019, continuing its phenomenal expansion in 2017 and 2018. Its older sibling, Facebook, may still have the largest user base, but Instagram is rapidly catching up. One notable difference is that Instagram is beloved by the young, whereas that demographic are now leaving Facebook because they perceive it as now being for their parents. 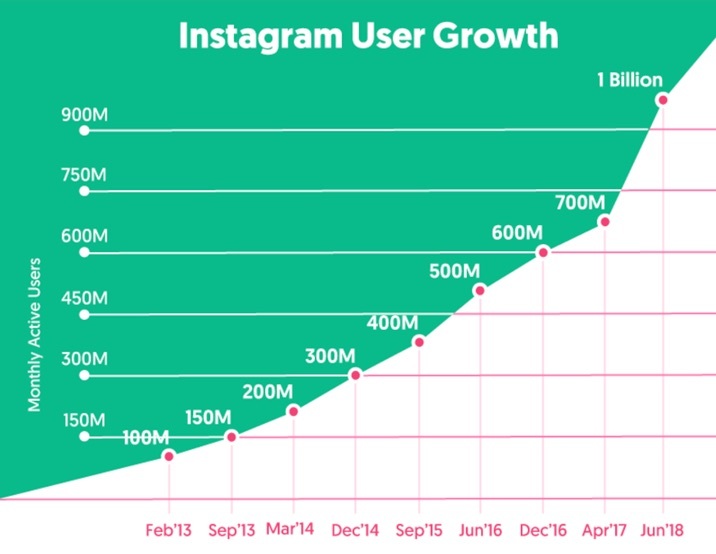 In mid-2018 Instagram announced that it had reached 1 billion monthly active users, and is now well on its way to the second billion. 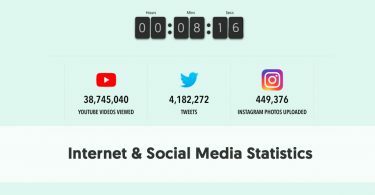 These users post 95 million photos and videos per day, along with uploading 400 million Instagram Stories a day. Instagram users “like” an incredible 4.2 billion posts every day. Instagram has genuinely become the powerhouse platform of late, particularly amongst younger social networkers and influencers. As influencer marketing has matured as an industry, it has attracted support companies and apps to simplify the process for both brands and influencers. Organic influencer marketing can be a slow and tedious process, particularly when it comes to finding and wooing influencers to promote your company’s products or services. 320 new influencer marketing focused platforms and agencies entered the market over the last 12 months. Back in 2015, there were just 190 influencer marketing platforms and agencies. This grew to 335 in 2016, 420 in 2017, and 740 in 2018 – more than twice the number that existed just two years previously. Earned media is publicity a firm gains from promotional efforts other than paid advertising. Earned media value is a monetary representation of this publicity. Businesses who understand influencer marketing gain impressive returns, up to $18 in earned media value for every dollar they spend on influencer marketing. Even average firms achieve impressive results, with an average earned media value of $5.20 per dollar they spend on influencer marketing. Of course, some firms lose. Indeed, 25% of businesses either lose money or just break even. These are predominantly firms who don’t understand the mechanics of influencer marketing, often businesses who select the wrong influencers for their brand. They often fail to choose influencers who have followers similar to the people who make up the target market for the brand’s product. Influencer marketing has continued to grow as an industry over the last few years. It was a $1.7 billion industry in 2016, increasing to $3 billion in 2017. Growth continued to $4.6 billion in 2018 and is expected to continue its upward trajectory this year to potentially become a $6.5 billion industry. A year ago, we reported a massive 325% increase in Google searches for the term “influencer marketing.” Searches rose from 3,900 searches per month in 2015, to 6,460 in 2016 and then 21,000 in 2017. Astoundingly this rate of increase continued. In 2018 searches for the phrase “influencer marketing” rose to 61,000. 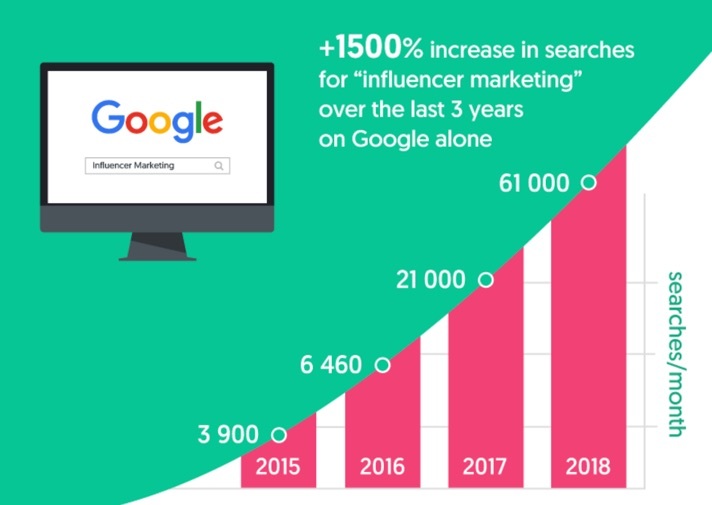 That’s an incredible 1,500% increase in searches for “influencer marketing” over just three years. Back on February 2013, Instagram was a comparatively small player in the social network sector, with a mere 100 million users. It reached 200 million in March 2014, the user base that Pinterest enjoys today. By December that year, Instagram reached the 300 million milestone (SnapChat has that today, and Twitter has only slightly more at 335 million). By June 2016, Instagram could claim 500 million monthly active users – as TikTok, formerly Musical.ly can today. Instagram reached the 600 million milestone in December 2016. LinkedIn hasn’t reached that figure yet but is approaching it with 590 million users. Instagram proudly announced that it had reached 1 billion daily users in June 2018, with only YouTube (1.9 billion) and Facebook (2.27 billion) being the only virtual communities with more active members. Although it is more difficult to find recent engagement rate data on comparable social networks, it is clear that the average engagement rate on Instagram was much higher than on Twitter in 2017. There are two clear trends evident from a survey of more than 100,000 influencer profiles in that year. Firstly, engagement rates fall the more followers you have. Secondly, engagement is much higher on Instagram than on Twitter, at all follower levels. For example, nano-influencers with fewer than 1,000 followers enjoy an engagement rate of 7.2% on Instagram, compared with 1.4% on Twitter. At the other extreme, influencers with over 100,000 followers have 1.1% engagement on Instagram, compared to a mere 0.3% on Twitter. Of our surveyed 830 marketing professionals and brand representatives who run influencer marketing campaigns, 69% focus on the B2C sector, with the remaining 31% running campaigns for firms in the B2B sector. This could be one of the reasons why so many of our respondents use Instagram, which is less prevalent in B2B marketing. According to statistics reported by Blue Corona, Facebook (89%), LinkedIn (81%), and Twitter (75%) are the three most used social media channels by B2B marketers, and only 33% of B2B businesses use Instagram. In many ways, influencer marketing can be thought of as the best delivery mechanism for content marketing. The two go hand in hand, so it should be no surprise that the phenomenal rise in influencer marketing is matched by an increase in content output. 77% of our survey respondents stated that they had increased their content output over the past 2 yrs. 60% of those surveyed admit to having a standalone budget for content marketing, compared to 57% in our 2017 survey. This is perhaps lower than expected, considering 91% of B2B marketers use content marketing, and 86% of B2C marketers believe content marketing is a key strategy. Presumably, most of those without a dedicated standalone budget for content marketing fund their content activities from a general Marketing fund. It should come as no surprise, considering all of the other positive statistics relating to influencer marketing, that our survey respondents were highly positive about the effectiveness of the activity. 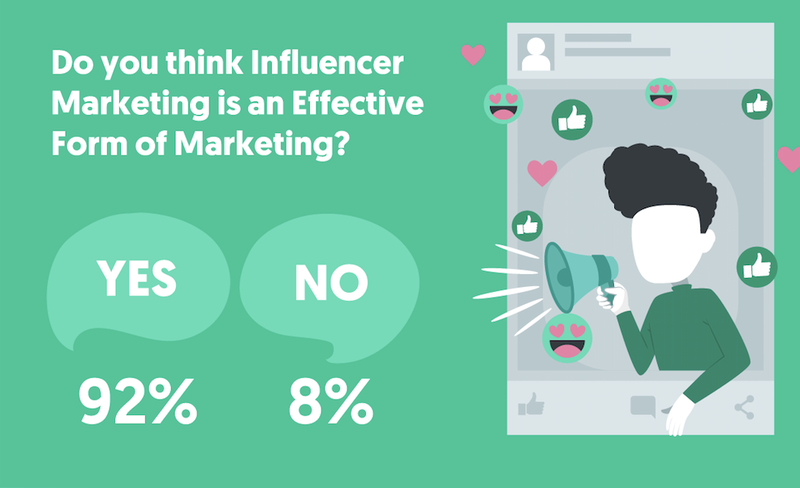 Indeed, 92% believe influencer marketing is an effective form of marketing. It would be interesting to know whether the 62 respondents (8%) who disbelieved in the effectiveness of influencer marketing, had had bad experiences, or whether they had never tried it. With such support for the effectiveness of influencer marketing, there should be no surprise that 86% intend to dedicate a portion of their budget to influencer marketing this year. It will be interesting to see whether this increases the percentage of firms with a dedicated budget, or whether businesses continue to pay for influencer marketing from their general marketing budgets. This compares to 37% of the marketers surveyed in our 2017 report who admitted to having a dedicated budget for influencer marketing. Nearly 2/3 (63%) of businesses who do budget for influencer marketing intend to increase their spending over the next 12 months, with 17% expecting their influencer marketing spend to remain the same. Allowing that 15% of respondents were unsure about what would happen with their influencer marketing budget, this means that only 5% intended to decrease their budget. This is consistent with the expected increase in influencer marketing over 2019 and the percentage of people who believe in the effectiveness of the marketing delivery medium. Of course, not all respondents will have control over their budgets, and this is probably reflected in the relatively high percentage of those unsure about how their organizations’ spending will change. Influencer marketing is, of course, just one part of marketing – predominantly the delivery mechanism for content marketing. Businesses have a wide variety of marketing activities for which they need to budget. 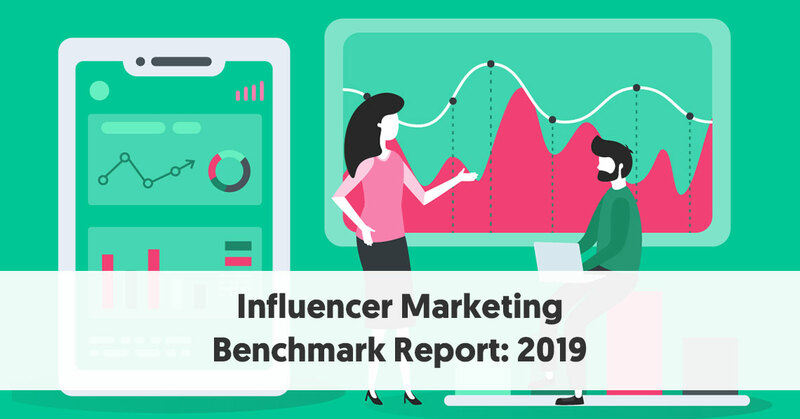 Therefore, it is interesting that 11% of respondents intend to allocate more than 40% of their marketing budget to influencer marketing in 2019. A further 12% will allocate 30-40% of their marketing budget to influencer marketing, and 24% will devote 20-30% of their budget to the practice. The most common percentage of marketing devoted to influencer marketing comes in the 10-20% range. Finally, the remaining 19% of firms have allocated less than 10% of their marketing budget to influencer marketing this year. Every firm has a different marketing mix, and even influencer marketing’s staunchest supporters acknowledge that they need to allocate some budget for other marketing activities. It is one thing to attract “customers” through marketing campaigns, but not all “customers” are of as much value to a business. Different customers spend varying sums of money, and the amount they spend may be low compared to the cost of attracting new clientele. This is particularly the case when you run campaigns for awareness, hoping to attract paying customers in the future. Our survey respondents, who were generally positive about the value of influencer marketing overall, agree that influencer marketing attracts high-quality customers. 82% believe that the quality of customers from influencer marketing campaigns is better than from other forms of marketing. One of the more impressive results from our survey was the finding that 70% measure the ROI on their influencer marketing campaigns. One of the initial complaints we heard in the early days of influencer marketing was that businesses found it difficult to determine an ROI on influencer marketing. Indeed, it was only a year ago, when we published 9 Mind-Blowing Influencer Marketing Statistics, that we discovered that 76% of marketers in a Linqia study said that the most significant influencer marketing challenge for 2018 would be determining their campaign ROI. Clearly, with influencer marketing now mainstream, businesses now understand the need to customize your ROI metrics to match your needs and have developed a range of suitable ROI measures for different organizations. Businesses now appear to understand that the best way to measure you influencer marketing ROI is by using a metric that measures the goals of your campaigns. For example, a business focusing on awareness should use a different measure of ROI success than a firm using influencer marketing to increase its sales. This comes through clearly in our survey results. 34% of our respondents clearly have awareness in mind, focusing on view, reach, and impression. 35% want their influencers’ followers to do something, and thus use engagement or clicks as their ROI measure. The remaining 31% have a more hard-nosed approach, and use their influencer marketing to generate sales. Their ROI relates to conversions or sales numbers. We have previously written about Influencer Media Value, which is NeoReach’s version of earned media value, adapted to influencer marketing. Influencer (Earned) Media Value provides a proxy for the returns on the posts that an influencer has historically given the firms he or she has worked with. It gives an indication of what an equivalent advertising campaign would cost for the same effect. EMV calculates the worth you receive from content shared by an influencer. The calculation of EMV can be complicated, and as such, it can sometimes be difficult for marketers to explain the concepts to their managers. However, it is clear that the respondents to our survey, as a whole, believe in the value of the idea. 78% stated that they considered Earned Media Value to be a good measure of ROI on influencer campaigns. It will be little surprise to discover that 81% of the respondents in our survey take their influencer marketing spending from the budget of their Marketing Department. The remaining 19% (presumably relatively large organizations) take their influencer marketing spending from their PR Department’s funds. Presumably, those firms in the minority group use influencer marketing predominantly for awareness purposes, rather than as a direct means to sell their products or services. 77% of our survey respondents claimed that they ran their influencer campaigns in-house, with the reaming 23% opting to use agencies for their influencer marketing. While some of these in-house campaigns will be developed gradually and organically, many will use available tools, such as influencer platforms to help streamline the process. This will be particularly so for influencer selection. Many brands prefer to use agencies when working with micro-influencers because the agencies are more experienced at working with influencers at scale. As we also saw in the survey, 320 additional influencer marketing platforms and agencies came into existence in 2018. It will be interesting to see if more firms choose to work with influencer agencies over the next few years. A surprisingly large number of respondents, 58%, admit to using tools developed in-house to execute their influencer marketing campaigns. This suggests that despite a considerable increase in the number of influencer platforms over the last few years, there are still opportunities for entrepreneurs to develop tools to simplify further the influencer marketing process. Elsewhere in this report, we have seen the recent growth and popularity of Instagram as a social network. Indeed, it is now the network of choice for influencer marketing campaigns. 79% of our survey respondents consider Instagram important for their influencer marketing campaigns. 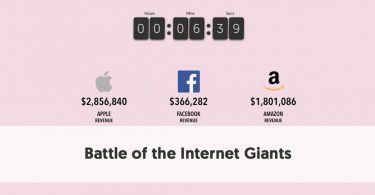 Instagram’s dominance is even more apparent when you look at the raw figures. 653 respondents state that they predominantly tap into Instagram for influencer marketing. Compare this with the question asking whether people intended to dedicate a budget to influencer marketing in 2019 – answered positively by 708 people. It is fair to say that most people planning to engage in influencer marketing this year will be using Instagram. The other social networks are all popular with some respondents – probably depending on the target markets for brands wanting to engage in influencer marketing. 46% of the respondents tap into Facebook for their campaigns, 46% YouTube, 24% Twitter, 12% LinkedIn (presumably those involved with B2B companies), and a further 12% spread across the less popular or more specialist social networks. Presumably, the Other category also includes influencer marketing on blogs. We have regularly referred to the fact that businesses undertake influencer marketing for differing reasons. The first step in any influencer campaign is to determine your goals and objectives. Therefore, it should be of no surprise to find that our survey respondents have three very different main objectives for their influencer campaigns. The most popular reason is to create a campaign for awareness purposes – 37% of our respondents engage in influencer marketing for this purpose. The second category, at 32%, has the more clear-cut objective of increasing sales. Slightly less popular, at 31%, is the group of respondents who engage in influencer marketing to build up a library of user-generated content. The perceived value of user-generated content is growing over time, and it will be interesting to see if more firms make this a prime objective in future surveys. A big topic of late in the news is a concern about influencer fraud. We have even written an eBook on the topic recently. Luckily there are now plenty of tools to help detect fraudsters, and this should reduce the effects of influencer fraud. Hopefully, it will soon merely be a chapter in the history of the industry. Influencer marketing fraud, including the effects of fake influencers, is a concern to 64% of our survey respondents. One reason that just under 2/3 of the respondents admits to having some concern about influencer fraud is that most of them have been bitten in the past. 63% of our respondents have personal experience of influencer marketing fraud in their past campaigns. Hopefully, with greater publicity regarding influencer fraud, and more robust fake influencer tools now available, fewer brands will have first-hand experience of influencer fraud in the future. As we have stated in our previous article on Influencer Marketing Challenges, past research has regularly indicated that most marketers believe that finding and selecting the best, most relevant influencers to be the most challenging part of influencer marketing. This is probably the main reason that so many platforms and tools have sprung up to assist brands and marketers in their influencer search. 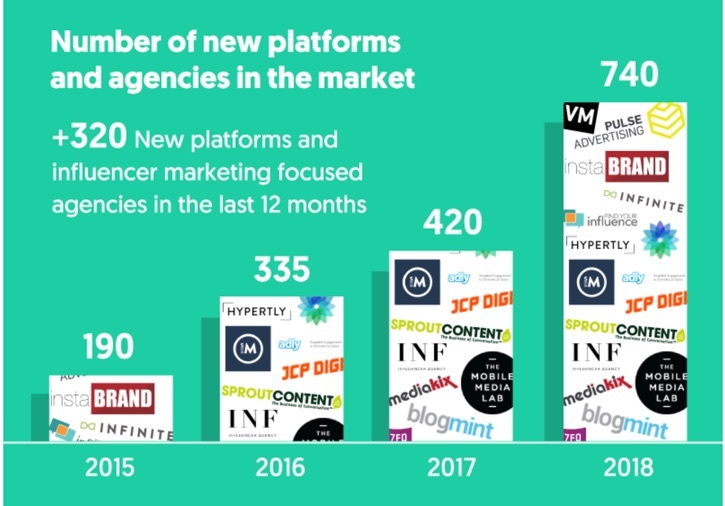 As we reported above, 320 new platforms and influencer marketing agencies opened in the last 12 months, 550 over the past three years. As a result, influencer selection is no longer seen as the major conundrum that it was in the past. Only 18% of our respondents consider finding appropriate influencers to work with in their industry to be very difficult. However, that isn’t to say that they consider it easy, either. Only 20% of respondents consider influencer selection easy. The bulk of respondents consider the problem of finding suitable influencers to be of medium difficulty. Another headline-making issue over the last couple of years has been influencers acting in a way deemed inappropriate by the brands they represent. For example, PewDiePie’s anti-Semitic videos in 2016-2017, upset some of the companies he worked with, and some like Disney deliberately distanced themselves from him. More recently, Logan Paul caused an internet storm over a tasteless video, and brands wondered whether they wanted any connection with him. Delmundo CEO Nick Cicero has observed, "There are more people to keep track of than ever before, and it's harder to do quality control. So you have to do the research to make sure some YouTube kid won't put your brand in a bad light." The key to a successful influencer marketing campaign is matching up with influencers, whose fans are similar to your preferred customers, and whose values match your own. Nearly half (49%) of our respondents believed brand safety could occasionally be a concern when running an influencer marketing campaign. 30% gave a more definitive belief that brand safety is always a concern. The remaining 21% believe that it is not really a concern. Presumably, this last group has mastered the art of finding appropriate influencers for their brands, and they have little concern about a values mismatch. A contentious issue in influencer marketing is the amount of automation you can successfully use. Some people believe you can automate virtually the whole process from influencer selection through to influencer payment. Others value the personal touch and think influencer marketing is a hands-on process. Even the specialist influencer platforms and agencies vary in their approaches. Some will only work with a select group of verified and handpicked influencers. Others swear by the algorithms they use to create massive databases of potential influencers, which you can sort by multiple criteria to find the influencers most suitable to any particular campaign. Therefore, it should be no surprise to see some considerable variation in views on whether influencer marketing can be automated. 57% believe in the automation process. However, a sizable minority, 43%, don’t think that automation can result in successful influencer marketing. 48% of the survey respondents believed audience relationship to be the most valuable factor when considering collaborating with a particular influencer. They see little value in working with somebody who doesn’t have a real influence on his/her audience, or perhaps has an excellent relationship – but they are the wrong audience for that brand. The second most important factor is content production. This will be particularly so for the group (31%) who named user-generated content as being their primary objective when running an influencer campaign, in our earlier question on influencer campaign objectives. The third popular reason favored by 23% our respondents found for working with influencers is distribution. Although this seems low, it clearly connects with audience relationship – influencers use their audience to distribute content relating to a brand. Amongst our recent predictions of Leading Influencer Marketing Trends for 2019, we saw a trend towards brands cultivating more long-term relationships with influencers. It is notable that although 65% of our respondents’ influencer marketing is campaign-based, the remaining 35% is “always on,” suggesting that these influencers are in long-term relationships. It will be most interesting to see how this statistic changes over the next few years. One of the most significant advantages of influencer marketing over social activity using official company accounts is the ease with which you can scale the activity. If you want to create a bigger campaign, all you need to do is to work with more influencers with larger followings – as long as they remain relevant to your niche. While organic influencer marketing may be difficult to scale, because of the time needed for influencer identification and wooing, there are now over 740 platforms and influencer focused agencies that businesses can use to help scale their efforts. 57% of our respondents believe that influencer marketing is definitely a scalable tactic in their marketing ecosystem, and a further 37% think that it is somewhat of a scalable tactic. Only 6% disagree with the sentiment. We have regularly seen that businesses have a variety of objectives when they create influencer marketing campaigns. 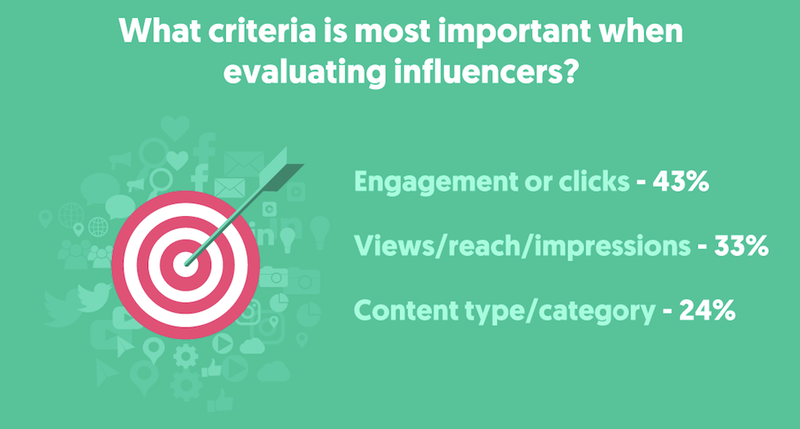 While the criteria by which our survey respondents evaluate influencers, does not precisely match their differing objectives, there is some clear correlation. 43% of our respondents rated engagement or clicks as being their most important criterion compared with 33% who opted for views/reach/impressions, and 24% who consider content type/category to be the most important. The fact that firms give so much credence to engagement is probably a reflection on issues caused by fake influencers. Many businesses have come to distrust less concrete statistics, such as views, reach, and impression due to so-called “influencers” who have inflated their stats in the past. Although only 25% claim that content type/category is the most important criteria, this percentage may be understated. Most brands start their influencer search by narrowing down the possibilities to just influencers in a particular niche – a beauty brand is unlikely to work with a home improvement influencer, no matter how engaged he is with his followers. Although there is no set way to run an influencer campaign, monthly is the most common frequency for our respondents. In an earlier question, we discovered that 65% of the survey respondents preferred to execute campaign-based influencer marketing, while the remaining 35% now run “always-on” campaigns. Of those who operate discrete influencer campaigns, 39% prefer to run them on a monthly basis. A further 28% run quarterly campaigns, and 14% prefer to organize campaigns on an annual basis. The remaining 19% take a different approach, and only run campaigns whenever they launch a new product. With a mix of different campaign timings, across a wide range of industries (many of which will be seasonal in nature), it comes as no surprise that the majority of firms (62%) vary their influencer marketing budget allocation across the year. If anything, this percentage seems low. Although some of the 38% who budget evenly across the year will run ongoing campaigns (and may pay their influencers consistently across the year), and some will reflect those contracted for annual influencer campaigns, some of this 38% may be firms with simplified accounting systems, who don’t budget in detail on a month-by-month basis. Interestingly the budget for influencer campaigns drops as the year elapses. The average brand budgets 32% of its influencer spending in the First Quarter, 28% in the Second Quarter, 21% in the Third Quarter, and 19% in the Fourth Quarter. In many ways, this comes as a surprise. While marketing costs naturally precede sales revenue, you would expect more marketing in many industries later in the year, in the lead-up to Black Friday, and the Christmas shopping period. Likewise, as we have seen, 19% of businesses restrict their influencer marketing to new product launches. You would think that there would be more product launches in the period leading up to the end-of-year holidays, than at the start of the year. According to The $100 MBA, “the product itself will determine when the best time of year is to launch. January, for example, can work well for fitness equipment or other self-improvement products that may help fulfill New Year’s resolutions. Spring and summer are best for outdoor products. Statistically, May and June are the top months in which cookware and other home goods sell, given that so many weddings take place in the summer. August is best for laptops and other things students will need come September. Could this just be a statistical anomaly? 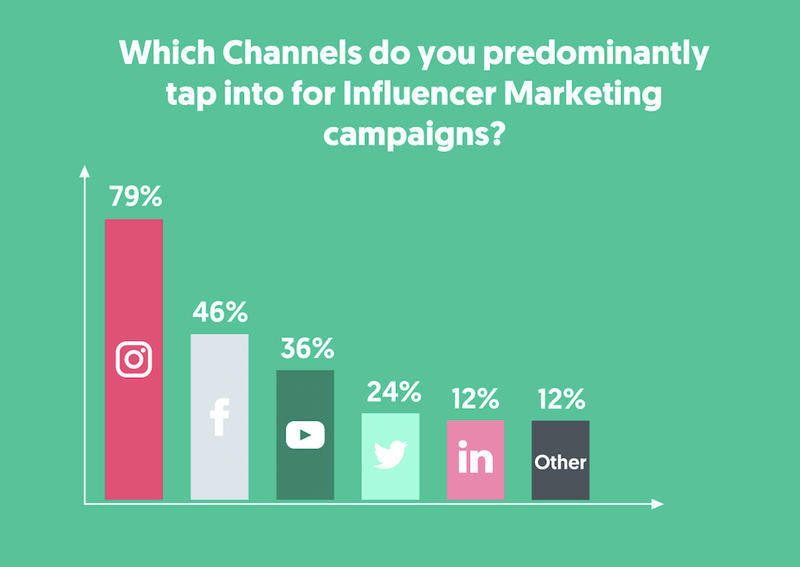 It will be most interesting to see if these results are replicated in our next influencer marketing survey. As much as influencer marketing has improved in popularity over the last few years, many people outside marketing do not know the term. Many traditionalists in business struggle to understand the concept of influencer marketing. Indeed, there are still firms, who have not embraced online marketing in any form, continue to rely solely on traditional marketing methods. 57% of our respondents have faced obstacles from their colleagues or managers when justifying their speeding on influencer marketing. The fact that there has never been a single clear-cut ROI calculation of influencer marketing has muddied the waters, with some accountants and senior managers demanding to view clear-cut ROI figures, proving the value gained from influencer marketing activity. 39% of our respondents stated that the main reason they had to justify the use of influencer marketing was that senior management did not understand influencer marketing metrics. A further 24% face the issue that the people they report to prefer traditional marketing. Is this a result of their lack of education about new methods of marketing? An additional 24% of respondents have had difficulty justifying influencer marketing due to underperforming campaigns their organization has endured in the past. As influencer marketing becomes more mainstream, and people begin to understand the highly respectable ROI figures generated by many firms, we should see a reduction in managerial resistance to their businesses participating in influencer marketing. One of the most significant advantages of working with a specialist influencer agency is that much of the difficult work is done for you. You explain your needs to the agency, and they recommend proven influencers willing to work with you. The agency will usually manage your campaigns, minimizing your day-to-day involvement with the influencer campaigns. Although the majority of firms manage their influencers in-house, according to our survey, most encounter challenges. By far the most substantial challenge (36%) is finding suitable influencers willing to participate. This can take a great deal of time, although the platforms provide a useful tool to streamline the influencer discovery phase. 24% find their greatest challenge occurs later in the process – the managing of contracts or deadlines for campaigns. 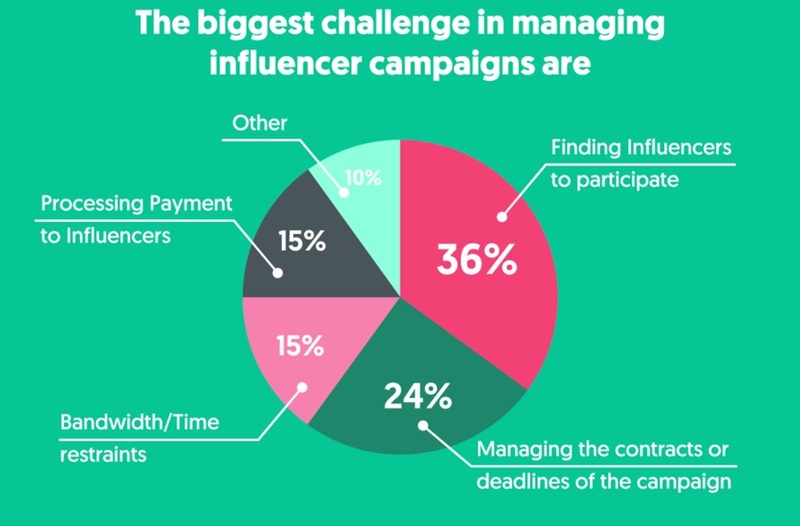 Closely connected with this, 15% see the most significant challenge as being the processing of payments to influencers once their work is done. A further 15% struggle with the logistical constraints of bandwidth or time restrictions. Both US government agency, the FTC, and its British equivalent, the CMA, have taken a close look at influencer disclosure over the last couple of years. They have made clear guidelines and expectations. The social networks, in particular Instagram, have made it easier for brands and influencers to comply with the requirements. However, influencers still have a long way to go to meeting the requirements. 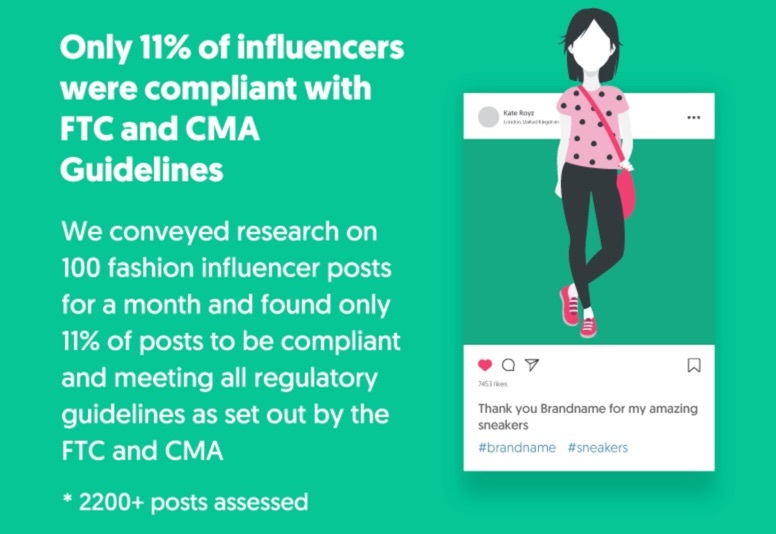 We undertook research on a sample of 100 fashion micro-influencer posts for a month during Q4, 2018 (*over 2200 posts analyzed) and found only 11% of posts to be fully compliant and meeting all regulatory guidelines as set out by the FTC and CMA over here. If influencers don’t improve their performance soon, there is a real danger that the FTC and CMA will start prosecuting, rather than just warning and educating. 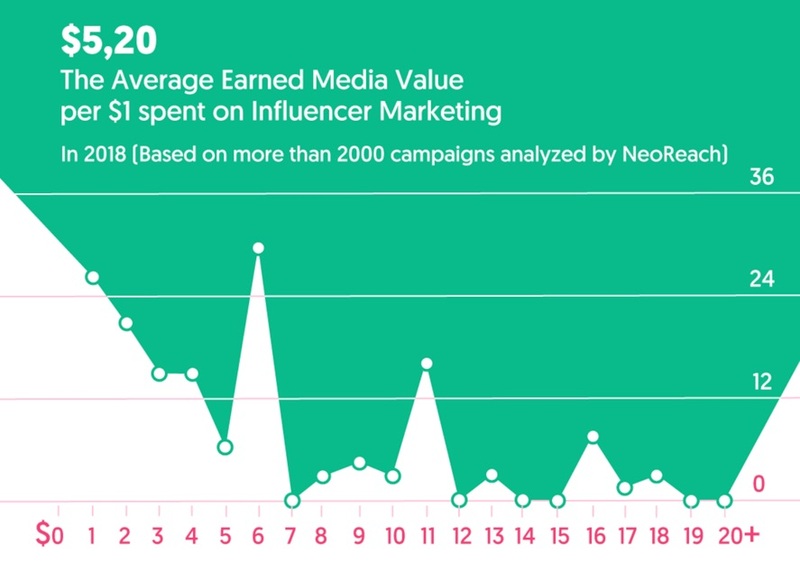 NeoReach has analyzed more than 2,000 influencer campaigns. They calculated that earned media value EMV averaged 5.2x per $1 spent. This means that dollars allocated to influencer marketing results in more than five times as many impressions and engagements compared to equivalent dollars allocated towards paid advertising. Branding campaigns saw considerably higher ROI compared to paid advertising. On average, campaigns focused on branding or engagements saw an 8x ROI. This means that influencer content is more than eight times as effective compared to alternative methods of brand building, such as paid social ads or television. Directly trackable ROI gives results that are more balanced. It is highly dependent on the vertical, Call to Action, and size of campaign. On average, direct response ROI (App Installs, Signups) was 1.8x per $1. While still very profitable, it is harder to see a directly trackable return on investment when the goal is to get immediate signup or action. NeoReach found that E-commerce ROI fell short on a directly trackable basis, returning approximately 80 cents per $1 spent. However, this does not consider the additional branding value, sales that come later in the funnel or sales that happen without clicking directly on the sponsored link. Influencers with 50,000-250,000 followers deliver a 30% better ROI per dollar spent compared to those with 250k-1M followers, and 20% better ROI than influencers with 1m+ followers. Put simply, the larger the influencer, the lower the ROI. It is important to note that while the ROI is higher when using smaller influencers, this ROI does not factor in additional time, management work, or resources required managing a larger number of smaller influencers. Although we discovered that only 11% of influencers are currently compliant with FTC and CMA guidelines, NeoReach has discovered that there has been a large increase in the number of Instagram posts using popular hashtags to denote advertising or promotion. 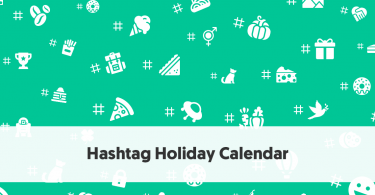 In 2016, there were 1.1 million posts using phrases such as #spon, #ad, or #brandname. This had almost tripled to 3.1 million by 2018, and is expected to rise to 4.4 million in 2019. 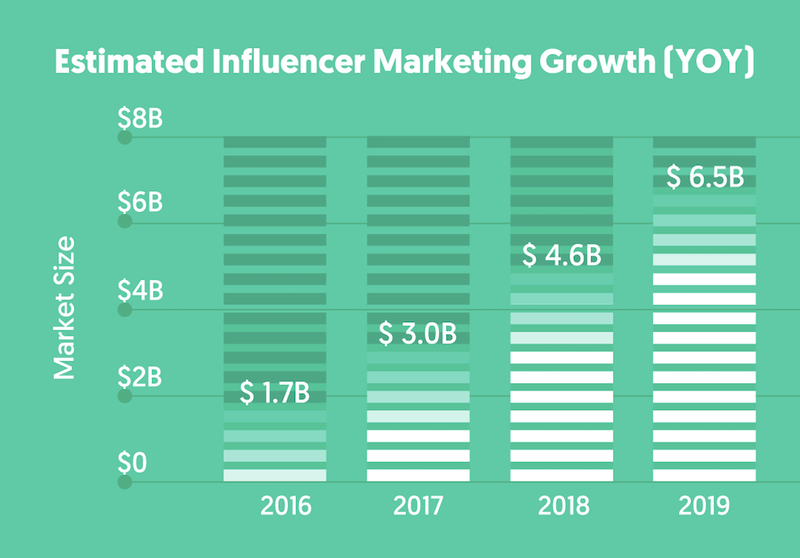 Influencer Marketing Hub saw the value in discovering the state of the influencer marketing industry in 2019. It was two years since we last conducted a (smaller) survey, and we felt there was a real need to discover how the industry has progressed. We partnered with NeoReach and Viral Nation to survey 800 industry professionals – marketing agencies, brands, PR Agencies, and others in related fields, to discover their views on the industry. Overall, we can see that influencer marketing is exceptionally healthy as we enter 2019. Any predictions of its demise are decidedly premature. The vast majority of our respondents are successfully running campaigns, and have plans to increase their influencer marketing spending and activity over the next 12 months.